You remember Urban Green, the development on N. 6th Street that we've shown a couple of times because we (perhaps, small-mindedly) feel that it could, under certain circumstances, be a threat to public safety. 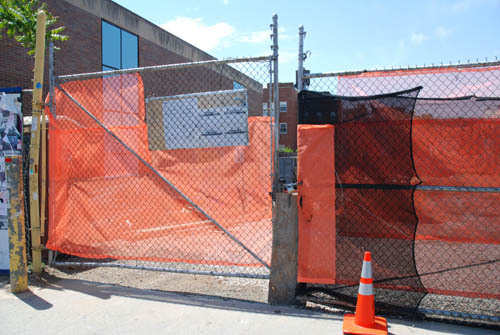 Well we've noticed that they've now shoved a board in their fence and secured the gate a bit more tightly, which we suppose demonstrates a willingness to place an obstacle between the public and harm. On the other hand, anyone can remove the board. Meanwhile, we're pleased to report that the sales office is open across the street, although things on the construction site itself are very curious indeed. The project, in fact, has a total of 9 different violations, 19 complaints and what appear to be two different Stop Work Orders. Even more interestingly, part of the gaping pit on the site has now been filled back in with stones and all the construction equipment is gone. Let's put it this way: If you're looking for a place with a rock solid, drop dead move in date, we wouldn't necessarily suggest putting your eggs in the Urban Green basket. Especially if the job ends up having any nasty safety-related construction issues. 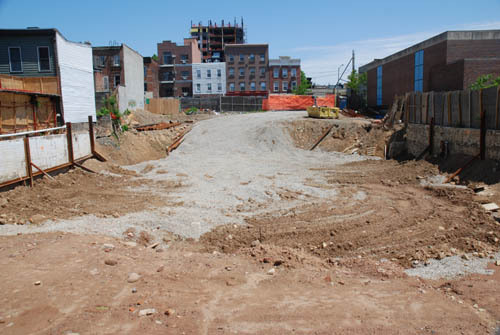 The photo below shows the sidewalk on the N. 5th Street end of the site. 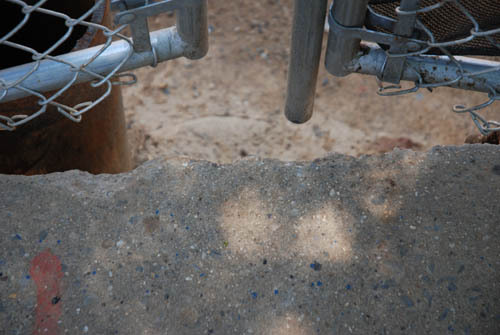 The good news is that since the hole was filled in, it would only be a ten foot drop if the sidewalk collapsed. The bad news is that there is nothing underneath that jagged concrete so there is a slight chance you could feel the ground move beneath your feet. FYI the Fire Dept was called to the Mini Mall bldg corner of Bedford and N 5th street across from Urban Green project on Sunday may 19th after about an hours or so of rain...due to smells of "petroleum" said one of the apt residents of bldg.The NYFD came after the Gas co had been called and said after checking the source was not a gas leak. The NYFD could not figure out source of smell either...They just hosed down the gutter...Note the gutter drainage by the bldg taps into the bigger drainage system in the neighborhood...Could it be that the as all the big dev happens here, they are disrupting the multiple oil leaks/pools that lie underneath williamsburg for decades..some known some no some forgotten...Now when it rains and the water tables rises there are often 'petro" ordors...and as they set to break ground on more condo towers..how much of the toxic oil pollution will get displaced and spread under existing homes that to date have had not problem...What a fu*king mess. Where is Bloomberg? Does anyone know what happened to all teh water that was in the excavation hole? If it was contaminated I would think it should have been properly removed or did they just pump it inot the sewer system?